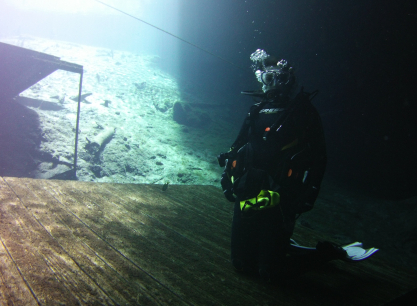 Kneeling on a platform at Blue Grotto Dive Resort in Williston, FL. Photo By Robby Myers. Well it’s the end of my internship at Bonnier, and I can’t believe how fast six weeks flew by. I’ve had such a wonderful summer per everyone at Bonnier and OWUSS, and I can’t thank these two groups enough for this experience. This week I worked mainly online to clean up Scuba Diving’s tagged web pages. It took the entirety of two days to go through the “Photos” tag and clear out articles that weren’t related to underwater photography. It seemed a bit tedious when I was given the assignment, but it was actually really fun to go through so many articles, especially ones dating back to the early 2000’s. Diving has sure changed a lot since then, and it makes me wonder how much it will have changed when I look back 10 years from now. Thursday was my last day in the office because I had a job interview in Gainesville on Friday morning. I applied to be the managing editor of The Independent Florida Alligator, a local newspaper run by the students of the University of Florida. I had worked at The Alligator for three semesters, and I wanted to take on more responsibility as the editor-in-chief’s right-hand woman. In the interview, I was able to talk a lot about my internship — especially about journalistic skills I’ve honed and ideas I’ve been inspired by at Bonnier. The hiring board was very impressed by my work with the dive group, and I got the job! I will definitely keep in touch with the Bonnier team, and I plan to contribute to both magazines in the future. I want to thank the entire OWUSS family for making this possible — it has been an amazing summer of growth and experience, and I am eternally grateful. 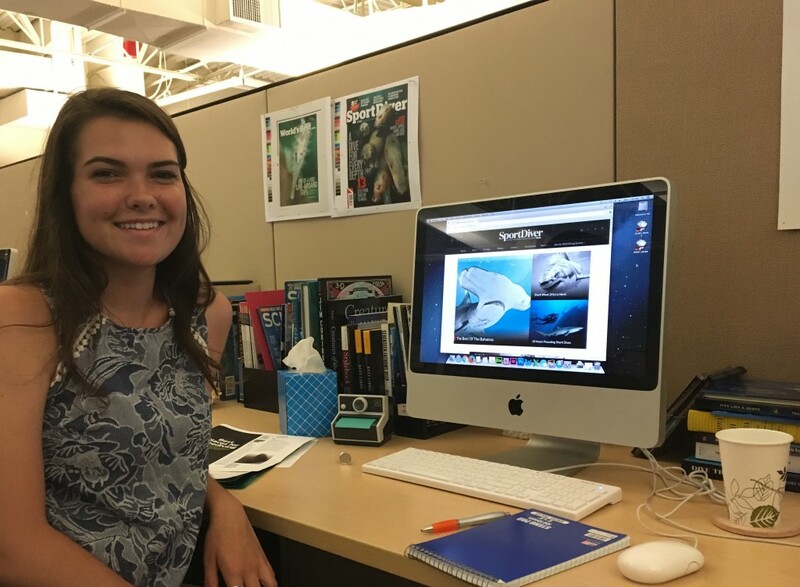 This entry was posted in 2016 Bonnier Dive Group, Internship Journeys on August 6, 2016 by Melissa Smith. First, I got to write a story on the bill that’s in Congress right now about banning shark feeding in federal waters. Right now, shark feeding is illegal in certain state waters (like Florida, California and Hawaii), but charters are still able to feed sharks if they go into federal waters, which are just 3 miles offshore. Shark diving and shark cage diving is one way to get humans closer to sharks, but the way to get sharks to the area is to feed them. While there is evidence against this, some say feeding sharks teaches them to associate humans with food. 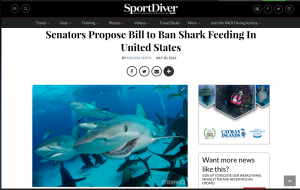 I broke down the bill to explain to readers how it could affect diving in the US. You can read the story here! In the SeaLife meeting, Sven Harms demonstrates how a strobe works. 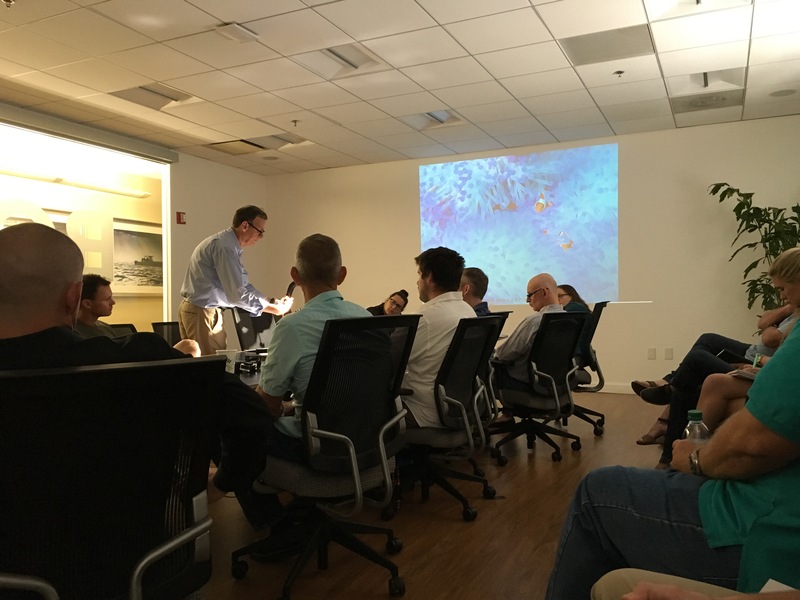 Another highlight of the week was that Sven Harms, the vice president of marketing for SeaLife cameras, came to the office. He held a demonstrative meeting for multiple magazines in the dive, fishing and watersports groups about how each camera and setup works as well as the many lighting options and how they can fit on cameras of different brands. I had used a SeaLife camera at Blue Grotto, and it was interesting to see the other rigs that are available. In the meeting, the representative gave away SeaLife T-shirts, stickers and even raffled off a camera and accessories. This was another exciting experience that I was glad to be a part of and that gave me a look into the brands and marketing side of the magazine. 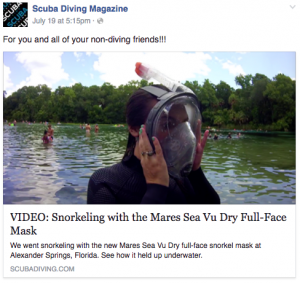 A final highlight of the week was seeing myself on the Scuba Diving Magazine Facebook page. When we went to Alexander Springs last week, Scuba Diving’s managing editor Ashley Annin and I “modeled” in a video featuring Mares full-face masks. While I wasn’t crazy about the product itself, it was fun (albeit a little awkward) to be filmed using the product. Robby Myers, the 2015 OWUSS Dive Group Intern who now works at Bonnier, edited the video and posted it online. It was funny to see myself on a Facebook page that has almost 300,000 ‘Likes’ from people all across the world, especially with such an odd-looking mask on. Needless to say, I shared that post 🙂 If you want to watch me in my 30 seconds (literally) of fame, here’s the video. This entry was posted in 2016 Bonnier Dive Group, Internship Journeys on July 29, 2016 by Melissa Smith. (From left) Becca Hurley, Robby Myers and Ashley Annin shoot at Alexander Springs. Thanks to Roger Roy, the gear editor of Scuba Diving and Sport Diver, I got to go diving again during my internship! 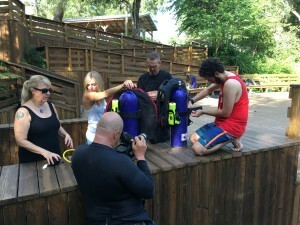 I went with Roger, Ashley, Robby and the Dive Group digital editor, Becca Hurley, to Alexander Springs to test underwater cameras, including a SeaLife camera, a DSLR in waterproof housing, GoPros and and an Olympus point-and-shoot. Robby takes a photo of Ashley with a point-and-shoot camera in waterproof housing. Alexander Springs is a smaller spring and swimming area in the Ocala National Forest. 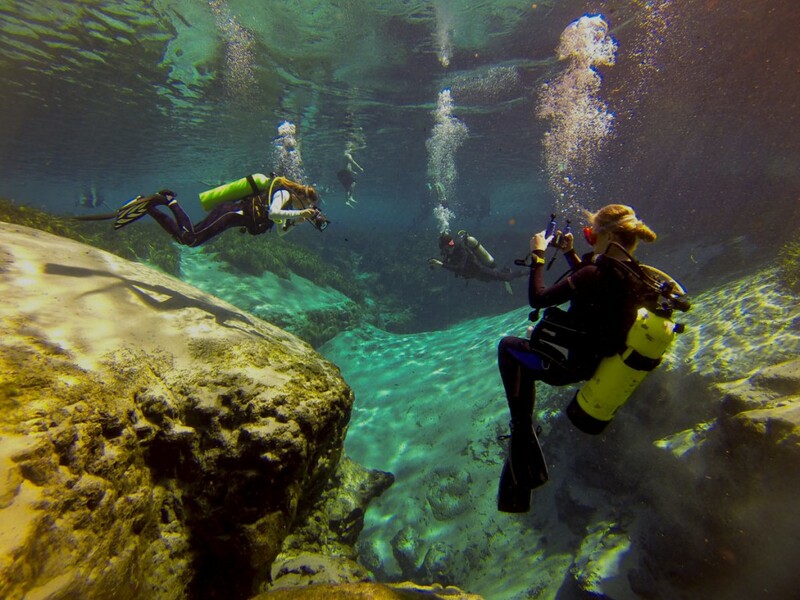 Despite going to school in Gainesville, which is about a half-hour drive from Ocala, I’d never been there before, so I was excited for the dive. We met at the office at 7:45 a.m. and loaded up my Jeep with tanks, gear and a rolling cart. Then we caravanned an hour to the spring. It was already pretty crowded when we got there, so we got our gear on quickly to try and beat dive classes to the boil. 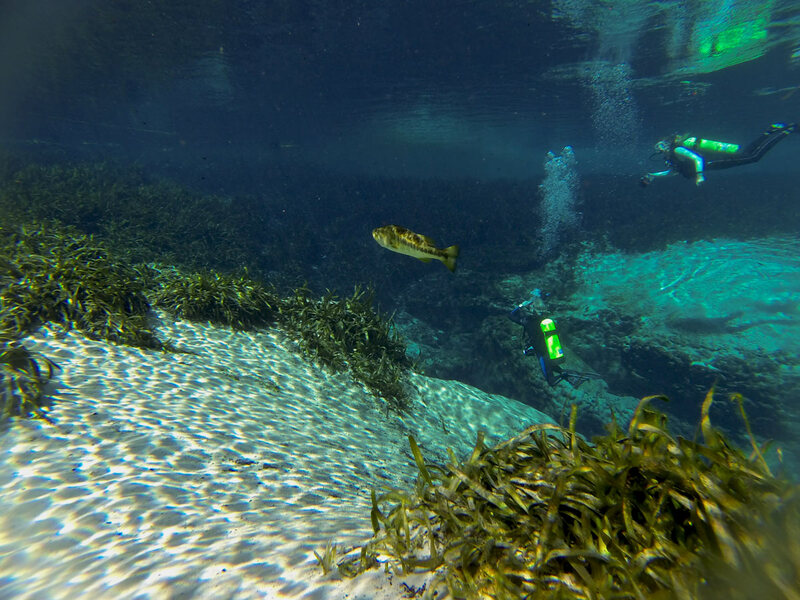 A bass swims in the beautiful Alexander Springs with Ashley and Becca diving in the background. After playing around with the cameras we tried out full-face masks, which were a little bit weird to me. It just doesn’t feel right to be able to breathe regularly underwater! The spring is beautiful. It’s clear as glass and full of friendly fish, bright green eelgrass and white sand. 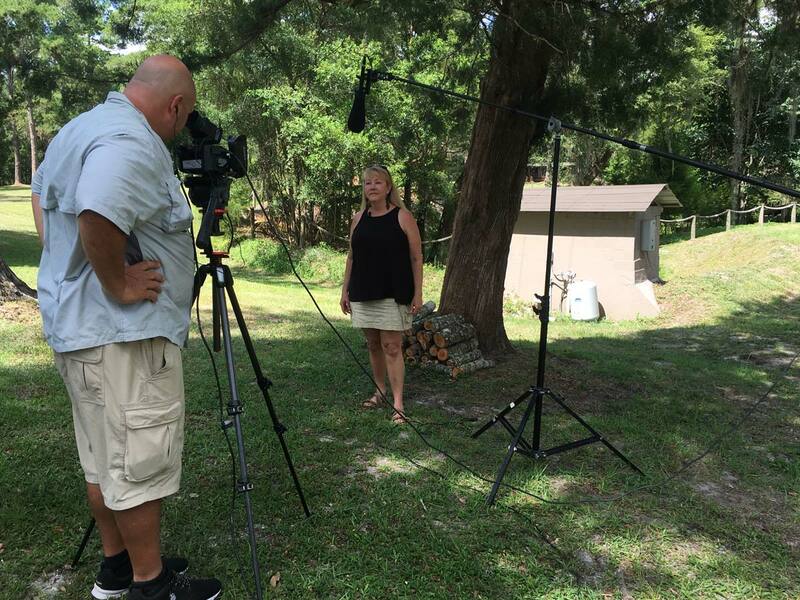 It was great to work with the different cameras and capture my co-workers in their element. This entry was posted in 2016 Bonnier Dive Group, Internship Journeys on July 20, 2016 by Melissa Smith. 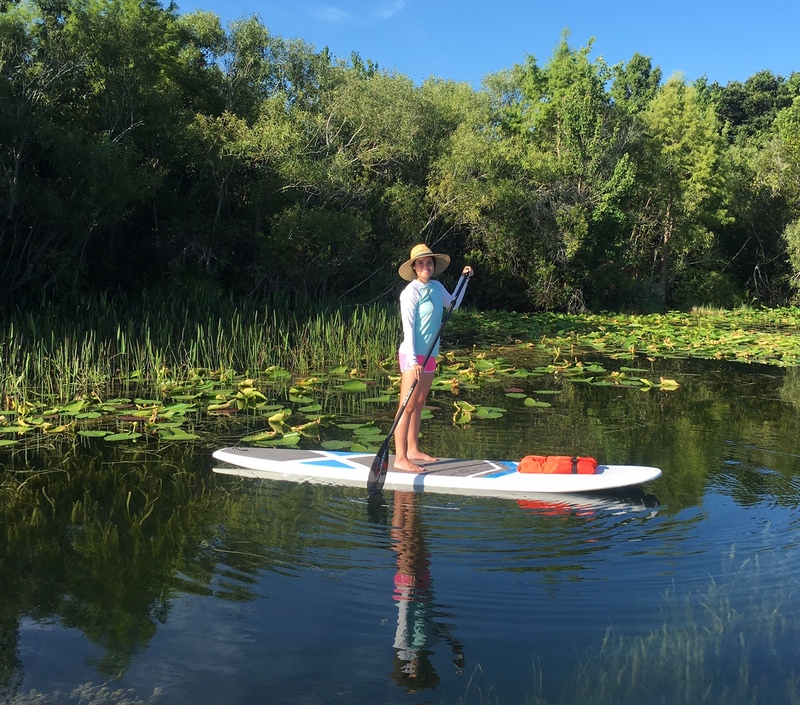 I didn’t have any internship-related photos from this week, so here’s one of me paddle boarding on downtown Orlando’s Lake Ivanhoe on the Fourth of July. Love this city! They say if you can get a job doing what you love, you’ll never work a day in your life. This is how I feel working at Scuba Diving and Sport Diver. I can’t believe my internship is halfway over! I’ve learned so much already, and I can’t wait to see what the rest of my time here at Bonnier will bring. This week was shorter, because we had off for Fourth of July, but it was incredibly busy. The managing editor of Scuba Diving, Ashley Annin, was out for the week at a friend’s wedding, and because we ship the magazine to the printer next week, I had to take over some of her managing editor duties. I was in charge of printing pages as they were ready to edit, putting them in folders to circulate the office, editing them and keeping our production tracker updated on the progression of pages. I had to print most of the magazine on the same day, and it was very fast-paced and commanding. I’m glad I got to take over these responsibilities and see just how the magazine operates when it’s crunch time. Everyone put in so much work that day to get things done on time, and it made me appreciate the Bonnier team even more. This week I also wrote my first print story for Sport Diver. 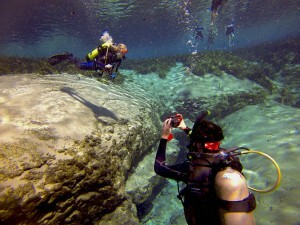 It was a dive brief about an archaeological site in Florida. I had great interviews with my sources — the kind after which you hang up the phone and know exactly what you need to write. I turned it in Tuesday, and Patricia, the editor-in-chief of the dive group, called me into her office Friday to talk about it. She had a few good changes, but she said she loved the piece overall. She said it was a blessing to have me in the office. What a compliment! 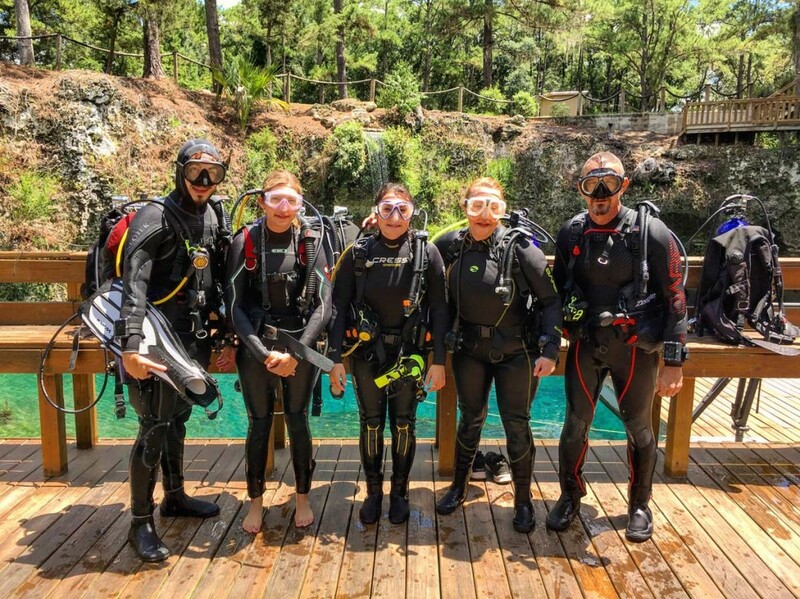 This entry was posted in 2016 Bonnier Dive Group, Internship Journeys on July 19, 2016 by Melissa Smith. Week 2 at Bonnier was a blast because I got to go diving! Holding an internship during which you’re surrounded by scuba 24/7 but at a desk 40 hours a week is tough; you want to dive more than ever, but it’s hard to find the time. The crew sets up gear while our videographer does test shots. Luckily, this week I got to get my fins wet at Blue Grotto Dive Resort in Williston, Florida, with Scuba Diving’s gear department, ScubaLab. We were filming ScubaLab TV spots in which an underwater videographer films staff members diving with different pieces of gear. 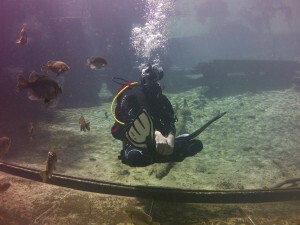 The divers test gear like computers, regulators, wetsuits and BCs and give them scores in a number of categories such as ease of use and effectiveness. 2015 OWUSS Intern Robby Myers hovers underwater at Blue Grotto. How does he do this? Well, he’s just that awesome. Blue Grotto is fantastic. I got to use a SeaLife camera for the first time to take my own photos (half of which did not turn out — hey, I’m used to just a GoPro, not a whole mini rig), and it was fun to capture some of my co-workers underwater. 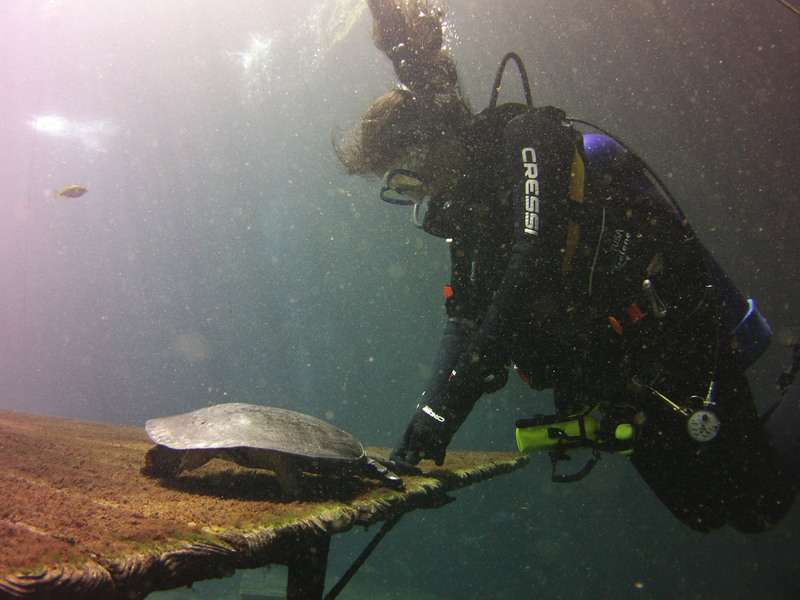 My favorite part of Blue Grotto is its friendly resident softshell turtle Virgil. He’s very curious and nice, and he’ll come right up to you to check you out — and see if you have any food for him. Here I am with Virgil, the resident softshell turtle. Usually softshells can be very aggressive, but Virgil is the nicest turtle I’ve ever met. Photo by Robby Myers. Mary Frances Emmons, the deputy editor of Scuba Diving, tells what she loves about the Suunto Zoop Novo dive computer. Another part of the ScubaLab TV shoots is stand-ups, in which the divers are filmed talking about their favorite aspects of the gear. In all, it was interesting to see what exactly went into shooting the videos, and of course, any day diving beats a day in the office. This entry was posted in 2016 Bonnier Dive Group, Internship Journeys on July 9, 2016 by Melissa Smith. Here I am at my desk at Bonnier. My first week as an intern at Bonnier has just come to a close, and I couldn’t be happier. Monday was a great introductory day. I met the whole team, including the editor-in-chief of the dive group, Patricia Wuest, and the managing editors of Sport Diver and Scuba Diving, Andy Zunz and Ashley Annin, respectively. I also saw Robby Myers, the 2015 OWUSS intern who currently works for the dive group. I had met him in New York during the OWUSS awards weekend in April, and it was great to see a familiar face in the office. One thing I was surprised to find out was that not everyone who works at these magazines is a diver. Impressively, even as non-divers they probably know more about the sport than half of the divers out there. By Tuesday I already had assignments piling up: book reviews to write, articles to edit and web pages to create for Scuba Diving. I worked mainly on the reviews, skimming six books that ranged from an autobiography to several fish identification guides and writing short blurbs about their content. I also worked on one of Scuba Diving’s Ocean Action briefs. Ocean Action is the section in which they highlight a conservation effort and how readers can get involved. The brief I wrote was about International Coastal Cleanup, which is supported by the Ocean Conservancy and Project AWARE and aims to get people picking up trash on the shore and while diving. Wednesday I got to help out on my first photo shoot. It was to shoot dive computers in Bonnier’s photo studio. I’d never been involved in something like this before, and it was really interesting to see what went into getting each shot perfect. Depending on the details of each computer, different props and stands had to be used. Also, the kind of lighting and positioning that worked for one computer was completely different from the next, so there were a lot of test shots to get the desired image for each piece of equipment. 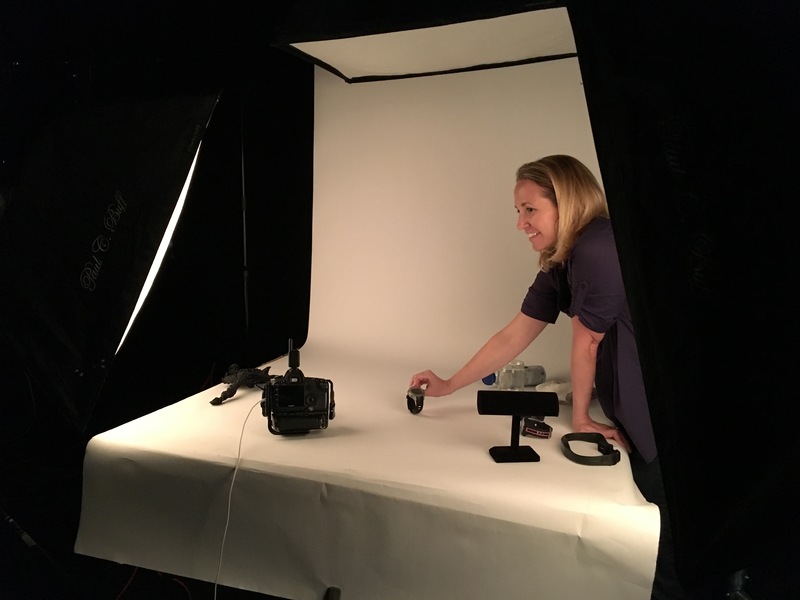 Scuba Diving’s photo editor, Kristen McClarty, holds a dive computer to be photographed. Thursday morning I wrote my first piece that was published on Sport Diver’s website. It was a promotion for Shark Week on the Discovery Channel that included a few paragraphs of text and the schedule of what was airing when. Thursday afternoon and nearly all of Friday I sat in on Sport Diver’s 2017 planning meeting. This is when they map out every issue of the year, come up with stories and flush out ideas for different features of each issue, such as best dive sites to see certain animals, good tips for divers and things of that sort. It was really cool to see how the team comes together to plan an entire year’s worth of content, and I’m glad I got to share that experience. Can’t wait to see what the next week has in store!